The summer of 1966 began just as the others before it, with the end of school. I was in the sixth grade and found myself again attending Joseph Lane School. 1966 was an interesting year for me as I saw the world evolving into something strange, yet wonderfully acceptable. We still lived in a carefree society void of aggressive technolgy that so plagues our world today. The boldest technological advancement in our house was our first color TV set. I remember watching the cartoon shows-The Lone Ranger especially, and seeing them in such strong vibrant colors. 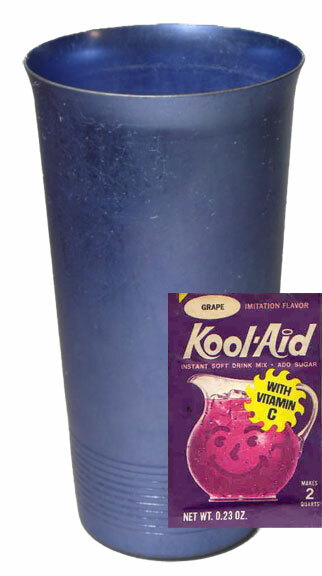 We used to have a set of anodized aluminum cups that we drank Kool-Aid from. There were many scorching summer days when I'd sit out in the yard with a nice cold tumbler of my favorite flavor. These aluminum drinking cups remind me of the time that very summer when I got to see a real U.F.O. I was parked in the shade of my friend's yard and we were drinking Kool-Aid from these cups. We just happened to be out under his tree, when he looked up first and pointed it out. (I will put up a page about this event later) Sorry, but there were no little green men. The Mod movement was in full swing, and fashions, media and attitudes were changing right along with it. I had my own problems with the "Mod" trends. They looked okay on celebrities, but I could never bring myself to try and dress with the new fashions. I still loved jeans and tennis shoes, T-shirts in the summer and sweatshirts in the winter. I wanted no part of striped bell bottoms or beads, yet at the same time, had no problem with anyone else wearing them. Mod just wasn't me. I felt like the world was turning too fast, and the newer, crazier clothes and fashions were a little stupid. I still liked "tough guy" clothes and fashions, and regular old Levis or Wranglers would never go out of style for me. However, "Mod" on TV was just fine, and some of the later sixties fashions I did like. Among these were Desert Boots and black long sleeve turtlenecks. The turtle necks were very cool, thanks to Mr. Illya Kuryakin from The Man from U.N.C.L.E. Secret agent attire was definite statement in the latter 60's, and wearing all black was pretty hot stuff. In fact, Illya Kuryakin was one of my favorite agents to watch on TV. On the theme of secret agents, private eyes, and cool clothes, TV Tough Girls like Emma Peel and Honey West were not only hormonally inspiring for me, but also wore very cool outfits. Honey's black turtleneck jump suit and Emma's leather and mod jumpsuits were very exciting. Mod clothes were okay for girls, especially for my favorite TV gals who could not only fight men like men, but looked incredibly chic doing it. Both Honey and Emma were on screen lookers with glam to go, and power to their punches. Emma Peel, with her ladylike presence was great when it came to high-kicks and amazing martial arts gymnastics. Honey West, with her pixie face and gorgeous blonde flip used her Judo skills to toss men around like paper planes. Both of these ladies fought hard, throwing guys across the room, or chopping them up like hamburger. Be a Karate master! Since Emma and Honey were so good at their fighting, I figured it had to be some secret that I needed to learn. It was in the early sixties that I first became fascinated with terminology like "judo chop" and other forms of the mysterious fighting techniques of Japan. One warm Saturday evening we'd all gone to the drive-in to see "Roustabout" with Elvis, and there was a great scene where he karate-chopped some local losers. Around 1966, I really started to notice on the backs of comic books, these ads for learning Judo, Karate and Ju Jitsu. So many of them boasted that a person could learn in just weeks! I always thought it would be really easy to master these martial arts since it only took weeks. I reasoned that since all of this stuff was so easy and quick to learn, the only reason every person in the world wasn't a Judo expert was because they just weren't interested. The hottest TV and movie stars-guys and girls- were "karate chopping" their way across the screen, and they all seemed to really know their stuff! By summer of 1967, I'd had my first experiences with certain Judo and Karate techniques that my brothers had learned in the Navy. It was all pretty cool stuff. It wasn't until the late 70's that I actually took it up seriously. I learned that it does not happen in a week or six weeks, and certainly not from a book! The summer of '66 was great, and it was hot outside with blistering temperatures driving more of us indoors to escape the sun. (Note that I say escape the sun and not heat since most people didn't have air conditioning.) Childhood interests were not dwindling among my friends and I. Many of us kids were still "kids", and during this period we'd retained our innocence despite the radical changes the sixties wave was rolling out. Bike riding was still the thing to do, and cruising neighborhood streets up and down (plus showing off for girls) was still one of the best things to do. My love for models was as strong as ever, and I still loved building them. I had finally acquired the "Batmobile" from Aurora. This model had been regularly sold out of our local stores for the longest time. There had been so much Batman gear coming out then; sweatshirts with the bat logo, the bat utility belt with a retracting cord and bat hook, and even Batman capes were sold in the stores. The world momentarily had "Bat-Fever" and I too was caught up in it. There was a kid in our class who had the first Batman sweatshirt, and he was the envy of the class. I still had lots of G.I. Joe stuff, and loved every minute of playing with those. (You can read more about that here. ).It was great to set up backyard bivouac scenes with the tent, machine gun, netting and other stuff. I think setting up the scenes were more fun than anything else. G.I. Joe gear was fantastic, and like models, I was fascinated by the precision of each piece of equipment. I used to dig out foxholes in the backyard and put sandbags around them for the machine gun, or just set up the tent and put up netting. Essentially, I suppose I just liked making and creating my own G.I. Joe dioramas and battle scenes. 1966 was also the year when I discovered the immortal "Thingmaker" from Mattel, and I got the "Creeple Peeple" kit (You can read more about that here.). This kit was so much fun and kept me busy for hours making multiple variations of "Creeples". Eventually I got the Fright Factory kit as well as the Creepy Crawlers set. Those last two were a bit inferior and not as much fun as Creeple Peeple. In America, the summer of 1966 was a bad time for The Beatles. For a brief period they seemed to be slipping into obscurity. This was disturbing and largely owing to the controversy of a statement made by John Lennon during an interview: "We're more popular than Jesus now; I don't know which will go first - rock n' roll or Christianity". Intended as a casual view of current trends in popularity, and excised from an interview about individual Beatles' lifestyles, the statement was re-printed in the U.S. via the teen magazine Dateline. Needless to say it rocked the rock n' roll world off its foundation. Politcally, it was one of the more earth-moving events of 1966, and for The Beatles, became a nuclear meltdown in their position as the world's top rock and roll band. In some states Beatles music was banned from radio stations, and "burn your Beatle albums" events were rapidly becoming a national American pastime. It was a sad thing, as the statement was taken completely out of context and printed as a singular quote without the benefit of the rest of the article to help define the quotation. It even took me awhile to recover from it as American media turned it into a vicious, and deliberate statement of superiority, when in reality, it was nothing like that at all. The recent changing of The Beatles personal appearances, i.e., moustaches and Lennon's iconic round granny glasses, were disturbing for me, and for a short period, I began to lose interest. It was not the politics of Lennon's statement that soured me, but the thought that they, like the times in general, were making all the wrong moves, and that their music would suffer for it. Fortunately, they proved me wrong, and they continued to be my inspiration. The song that solidified them for me forever was "Hello, Goodbye". Songs were definitely getting better, and one of my absolute favorites was "Green Grass" by Gary Lewis and the Playboys. The virtual hit machine of The Lovin' Spoonful gave us monster hit after hit in 1966 with "Summer in the City","Daydream", and "Did You Ever Have to Make Up Your Mind". The Lovin' Spoonful seemed to have a knack of writing immediately recognizable hits that had a commercial-jingle appeal. "Hanky Panky" by Tommy James & The Shondells, "Sweet Pea" by Tommy Roe and "Dirty Water" by The Standells were also top hits ("Dirty Water" was the second guitar riff I'd figured out.). The Animals' "Don't Bring Me Down" and "Hungry" by Paul Revere & The Raiders stamped their signatures on the rapidly changing musical style of the mid-sixties. New innovations in sound were beginning to emerge, changing the face of Doo-Wop style melodies forever. The "Fuzz" guitar sound was coming into its own, rapidly replacing the cleaner, "reverbed-up" traditional rock and roll sounds from earlier in the decade. A prime example of this more sophisticated and polished sixties sound would be another smash hit from The Rolling Stones: "Paint it Black". The Beach Boys' "Sloop John B." was exemplary as a professionally studio produced pop tune, and everybody's anthem of 1966 "Wild Thing" by The Troggs urged us all to turn up the speakers as far as they would go. These were just a few of the greatest hits of 1966. "Music to Watch Girls Go By" by the Bob Crewe Generation 1 is probably one of the most robust instrumentals that provides a classic late 60's signature sound that would soon set a powerful trend in the music industry. The most irritating songs of 1966 would have to have been "They're Coming to Take Me Away Ha-Haa (To The Funny Farm)" by Napoleon XIV. Sadly, this song takes up space in my memory where other things ought to be. I picked up my first transistor radio for a dollar. It was an AM only radio, but I could tune into our local station KISN to hear all the greatest hits. The radio had the worst sound, and even worse reception, and came with a single earplug that was even worse than the sound and reception combined! For a dollar though, it was great fun though the battery life wasn't so great. The old plastic dials for the stations and the volume were fun to fiddle with, but after awhile, the sound was just too awful. It really didn't matter as the music that was being performed was still great despite cheap transistor radios! By this time my interests in the outdoors and camping had soared to incredible new heights. I was completely captivated by the idea of adventure and the allure of the wild. My dad had several of these old pocket knives in his garage, and I remember being given a couple of them. By this time I acquired an army surplus sleeping bag and and a tent, and often set up everything in the backyard. I even built a faux-campfire using real wood surrounded by rocks. To make it look like a fire I put dandelion heads in the bottom to give it the necessary yellow. It actually worked! I must have spent hour after hour going through the catalogs looking at camping gear! 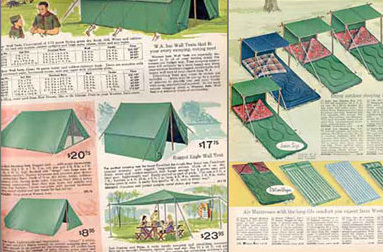 All of it was so great, there were tents (the ones with the zippered screens were the coolest), sleeping bags, canteens, stoves, knives, boots, and just about everything that made the camping world so exciting. Great Movies & Summer Evenings at the Drive-In! Movies were great in 1966-not only great-but fun. I really loved some of the classics that were pure nonsense as well as pure fun. Among these weres "The Glass Bottom Boat" with Doris Day and Rod Taylor, and "Ghost in the Invisible Bikini".one of my favorites in the horror genre: "Chamber of Horrors" with Patrick O'Neal. Other films like "Who's Afraid of Virginia Wolf? ", "Alfie" and "The Sandpebbles" left their indelible marks on cinema. "Georgy Girl" and "Born Free" were top hit movies with theme songs that seemed to jetison the movies to super stardom without ever having to be seen. Drive-in theaters were great entertainment for us, and we went to see many of them just to get out of the house and into the cooler summer evening air. There were even outdoor seating areas in case it was just too hot in the car. People could actually walk into the drive-in if they wanted and sit on the benches. We used to go see westerns a lot because they were my dad's favorite. We saw "Night of the Grizzly" with Clint Walker who was probably much larger than the Grizzly he was tracking! I absolutely loved this movie, and that bear kept me on the edge of our back car seat. We also saw "Nevada Smith" which for me, was one of the best movies ever. You just couldn't go wrong with Steve McQueen. We'd taken my friend from next door with us. There was one scene in particular, where a dance hall girl (in a small part played by the ever-charming Joanna Moore) is trying to entice our hero by letting the straps of her dress fall off her shoulders. This caused my pal to duck his head down behind the seat in embarrassment. It just goes to show how innocent and shielded we were back then! Another surprise favorite for us was "Cat Ballou" with a very memorable Lee Marvin. "One Million Years B.C." which I'm sure my dad loved (for obvious Raquel reasons), was another drive-in delight. Actually, he was conned into taking us all to see the movie. Even bad movies were great at the drive-in. One movie that my dad really wanted to see was "Your Cheatin' Heart", the biography of his favorite country singer Hank Williams. The movie for me was only so-so, but he loved it and that's really all that matters. And so went those wonderful days and the summer of 1966 as we spent hours of fun at the drive-ins, running through sprinklers on hot days, riding our bikes, playing with toys and models, and listening to the greatest music ever. I was young and still innocent, but getting wiser to the world. Abrupt changes in trends and lifestyles, and the ever-approaching paradox of adulthood still loomed like an albatross, but in those yellow days, I was young, free and full of dreams.